And if you haven't seen them already around blogland yesterday (I had to miss the hop because of the Quilt-A-Long Parade) , these were made as part of the Fat Quarter shops kick off to Shortcut Quilts. This is a whole new little ditty the Fat Quarter shop is starting where you can get this pattern as a free download on their website. And as an added bonus, they also have made a 20 minute video tutorial on how to put the entire quilt together, start to finish. It is fantastic!! And if Soho Chic isn't your favorite, no worries. 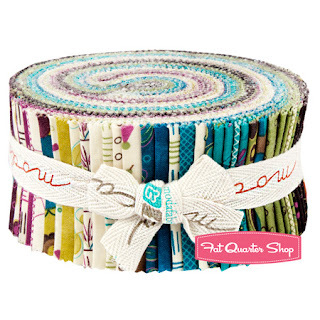 To celebrate the release of Jelly Roll Jam, The Fat Quarter Shop has their entire stock of Jelly Rolls marked 20% off until September 20 Trust me, that is a lot of Jelly Rolls to choose from :) Happy Shopping!!! Very cute quilts. I am working with a jelly roll myself right now. I love the variety in one little roll. I love jelly rolls because they're so versatile. Two baby quilts from one jelly roll? Can't beat that. Or a jelly roll and a little yardage and you've got a great couch quilt. That Soho Chic is so pretty. Thanks for the chance to win. Jelly rolls are great for so many things! I really love that Soho jelly roll and would love to make a quilt out of it (I'm thinking herringbones). Also, every time I cut a bunch of strips for sashing or binding, I find myself wishing for the simplicity of a jelly roll! Love Soho Chick! Your quilts are adorable! Jelly rolls are great because you can use a few of the left over strips for scrappy bindings :) Thanks for the chance to win!! I'm a Jelly Roll virgin! Seriously, I've never used one! I haven't used a lot of pre-cuts, well okay in fact I've only ever used one - a charm pack - that's it! Maybe I need to give the whole jelly roll thing a whirl! I love the variety in jelly rolls. There are so many choices from patterns to fabrics and none turn out the same. I've just used my first ever one and I loved it, I love all the different fabrics and the fact there's usually hardly any (if any at all!) cutting. jelly rolls work great for binding strips, and many other projects with very little cutting needed - a great way to try out a new line of fabric. I like jelly rolls because the cutting is done for you. They are so versatile too. I love how pretty Jelly Rolls are. They look so nice on the shelf while you figure out what to do with them. I love Jelly Rolls! They are fun and so versatile! I love that jelly rolls speed up the process & I get to sample a wide variety of prints. Since cutting is probably my least favorite part of quilting, I love having nice jellyroll strips ready to sew together. With one jellyroll, I can get a good sized lap quilt made over the weekend. Thanks. Jelly rolls are fantastic for the variety and for binding strips as well. Thanks a lot for the chance! I like that there is such a variety in a jelly roll. The precuts make it quick to jump in a start a project (& finish) instant gratification. My niece just announced she wanted to make a quilt, first thought grab a jelly roll. Looks like a great project to get her started. I love not having to do all that cutting! Love the quilts! I LOVE getting so many different prints in one quilt with a jelly roll. I love the fact that you can use them to make a huge variety of things and it cuts back on cutting time! Thanks for the chance to win! I love that the cutting is already done for you. I love having a full range without having to make those tedious cuts, which I always screw up somewhere! These turned out lovely. I am making this pattern right now, but I did one of the 'Jam' and the other half of the roll I am using the 'race' pattern - two looks from one jelly roll. Jelly rolls are just a really quick go to item, especially for baby and children's quilts. I love the variety of fabrics in the roll and how they blend together. I love that the "prep" work is already done for me and that I don't have to cut and pull coordinating fabrics. I work 2 jobs and take care of a family so I want my down time to be for sewing, not for the fussy stuff! I like that there is variety....and they're already cut. Cutting is the bane of my existence! I really like jelly rolls because I feel they are quite versatile. Many patterns seem to call for 2&1/2 inch squares or rectangles that are 2&1/2 inches wide. Love them! Thank you for the chance and those quilts are awesome! I haven't bought many jelly rolls, but that new pattern and youtube is great...I have one I won a while back I might just use for this purpose! Thanks for a lovely giveaway. I love Jelly rolls. You can have so much fun with them. The colors are already matched up, can use them for strips between your blocks. Make pillows and easy quilts. Best of all they are already cut and ready to use. I just was looking at this pattern yesterday & drooling over the possibilities with jelly rolls!! Love the colors you used. I love Jelly Rolls. I have 4 Jelly Roll quilt tops done. They are fast and easy and will make great Christmas presents for my grandkids! Love Jelly Rolls.......no need for cutting....no crooked lines...easy peasy. I love how quickly a quilt top comes together from one jellyroll. 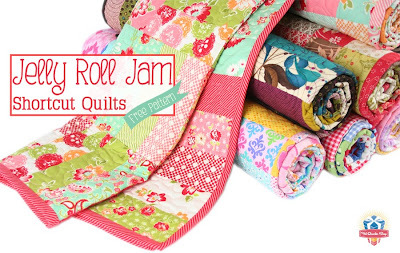 And I really like the Jelly Roll Jam quilts, too - I'm making one right now! I actually haven't worked with a jelly roll yet but the fact that they save time on cutting seems like a real perk! This pattern is so fun! out the fabric. Thanks for the giveaway! One of the main things I love about jelly rolls is that you can do so many quick, easy projects like this. Everything coordinates and that saves you from having to pick out fabrics that go together. What's not to love about jelly rolls. There is a surprising amount of fabric in them, and there is so much you can do with 2.5" strips or squares. I use lots of them. Thanks so much for the chance to win. I love jelly rolls because the cutting is already done for you and no crooked lines. I've actually have only sewn one quilt using the jelly roll. It really went fast. Thank you for the giveaway! Cutting is my least favorite part of quilting, so that's a big bonus to jelly rolls. I adore jelly rolls... there are so many great ways to use them! Cutting isn't my favorite part of quilting so I'm a huge fan of pre-cuts... plus you get to play with an entire line of fabric. What's not to love? I've never worked with jelly rolls, but I do love precuts for the convenience factor. Thanks for the giveaway! Wow, I love that. All those fabrics are beautiful and I would love to make a jelly jam!! I love jelly rolls because I hate cutting fabric, they're cute, convenient, and you can do a lot with them! Oh goody! I saw the post this morning and downloaded the instructions into my phone. Can't wait to try it--I have 3 friends/family that I want to make yikes for in the next couple of weeks, so something quick is the ticket! I love jelly rolls--you get a sample of every fabric in a collection, how cool is that!? Quick and easy and fun. This little quilt is so gorgeous! I love the video showing the steps to making it :-) I love Jelly Rolls for the shear ease of having a complete fabric collection to play with! Soho chic is wonderful! The versatility and the ability to quickly put together a quilt. Super cute! I love that you can make quick & easy quilts with them that are still beautiful. This pattern really looks great. I love the versatility of jelly rolls. There are so many possibilities! I love jelly rolls because they are already cut to size. When I want to make something that's a fair size it's easy to just piece away. I love the convenience of jelly rolls - they are so fun. Jelly rolls are great, you can have an entire line of fabric in one quilt. Love this Jelly Roll Jam! Looks like great fun! Love your quilt and your quilting! Great work! Thank you for sharing and for this great giveaway. My favorite thing about Jelly Rolls is the opportunity to use bits from the entire line. I love seeing all the colors together. Your quilts are beautiful, Melissa. Really, really love that combination! I've never used a jelly roll so I guess I can't tell you what I like about them. I did download the pattern and watch the video. I think I have to start looking at those jellies! I love jelly rolls 1. 'cuz they're pretty. 2. They're already cut for me. 3. Coordinated, so I don't have to make any decisions! Jelly rolls mean instant gratification because most of the cutting and fabric selection has already been completed! Nice job on your quilts. Jelly rolls remove the inadvertent wonkiness from my life! I love that the color coordination is already for you because not all of us has that talent. Thanks for the giveaway. I love jelly rolls because you get the entire line all at once. Quick, easy quilts and you don't have to stress about matching colors and patterns because it all works together. Thank you! I have never worked a jelly roll yet but I would love to win this one and then make the quilt with the free pattern! thank you for this giveaway and your blog! I love jelly rolls because you can get right into sewing! also the colors and patterns are nicely coordinated. I love jelly rolls because I love scrappy and they give you the entire spectrum of the line with no effort. Love them! Thanks for the giveaway!! I love jelly rolls because the colors are picked for me! Just love them! love the jelly roll idea for less cutting. I have been wanting to try the jelly roll race quilt. Very cute quilt! I using jelly rolls because I don't like cutting all those strips of fabric. They are all rolled up ready for you to sew other than cutting lengths. Thanks for the chance to win. I really like jelly tools because they are great for strip and string quilts. Table runners and baby quilts come together super fast and look so good. Having a whole line in one cut is so convenient. Thanks! Jelly rolls! Silly auto-correct. Well, really... they are tools... so... never mind. Jelly tools!! I like that a jelly roll lets me get a bit of each fabric in a collection. There are so many great fabric lines coming out lately that I just can't buy yardage of each one that I like. So pre-cuts work. I have several books of jelly roll patterns so I know there are lots of different things that can be made with strips. I love the colors and prints in this cute quilt! I love Jelly Rolls - great pattern :) Thanks for the chance to win!!! I love that they are already mostly cut up for me. And as always your FBQ is fabulous. I love jelly rolls because you get soooo many different prints in each one, and they all coordinate so it's east to get a lovley quilt and very little waste! I enjoy your blog and I just love this fabric line! Thanks for the chance to win a jelly roll of the gorgeous prints. I love the convenience of a jelly roll. There are so many great ways to use them. *gasp! * I have never used a Jelly roll! I've always wanted to. They are so pretty when they are all rolled up! What's not to love about jelly rolls? They are precut and so versatile. Jelly Rolls make baby quilts SO EASY! I think jelly rolls are just so versatile. Even though I can cut my own strips, this gives me a whole fabric line to play with. Thanks so much for the giveaway! I have the beginnings of arthritis in both wrists, so I love jelly rolls because they cut down on wrist strain/pain. May I leave two reasons I love them? Okay, first is having a sampler of every fabric in a line, and second is less cutting! Thanks for sharing your pretty Soho Chic version of the Jelly Roll Jam. I always love that the colors in the jelly roll always fit so perfectly together. Sometimes things I would have never put together look awesome in a jelly roll. Thanks for the chance to win! I love the idea of not cutting strips and the variety of prints! Beautiful quilts! I love the variety in the jelly rolls and the cutting is already done!! Jelly rolls are a fun little easy "treat" to pick up when you are traveling. Lots of fabrics in one tidy little bundle! Now I have yet to make anything with mine, but Melissa's cute quilts are an inspiration for me! Thanks for the giveaway offering! I love that they have just enough to play around with and not have to cut into my Yardage. The variety is a Bonus and they all go together. Thanks for a chance to win this FQ Bundle! My favorite thing to to is to sew strips together. Then I usually cut them up and sew them together again. And jelly rolls are always cut straight! Love the quilts. Fast and easy quilts with little (or no) cutting!! I've made several jelly roll quilts (with yardage) What's not to love? I love jelly rolls because the fabrics are perfectly matched while helps with quick projects! I also love to pet them and display them in my quilting room as beautiful decorations on their own. It's precut! All you have to do is sew! What's not to love about that? Jelly rolls are great for fast quilts and save so much time cutting! Love your quilts. What a great pattern! I love jelly rolls b/c you are guaranteed coordinating colors and all the initial cutting work is already done. There are so many patterns available for jelly rolls that it is hard to choose which one to do. This one is so simple and quick--I agree, it's definitely a go-to pattern for a quick baby quilt! My faorite thing about jelly rolls is they are already cut!!! I love jelly rolls because the make such easy quilts that turn out beautiful! These are some colors that I don't currently have in my stash and I'd love to play with them. Jelly rolls are a great way to get a variety of prints - I love a coordinated scrappy look. Jelly rolls can make the perfect quilt fast, I just love them. They are precut and you can make s many things with them along with matching layer cakes. I love how you get a sample of the whole fabric line in one project without buying yards and yards of fabric! I love the pre cut and that there is a fabric from the whole line! I love the convenience and that all the fabric matches. I love jelly rolls because they are so versatile and fun to work with! I love jelly rolls because its less cutting time. And besides that aren't they cute? Makes it hard to open them up! I am making a quilt using a jelly roll at the moment and I am really enjoying it. It comes together so quickly, and you are guaranteed to get a beautifully co-ordinated quilt at the end. My favorite thing about jelly rolls? I DON'T HAVE TO CUT THEM!!! Jelly rolls save lots of cutting time and they cut down on wracking my brain to figure out if this will work with that! They're all coordinated for me! I love that there's so much variety with no cutting. Thanks for the chance. Very cute! I love precuts and particularly Jelly Rolls for the variety they add to my stash! HELLO,love Jelly Rolls for their size,exactness and cuteness! I love that they are precut. I love that you get samples of the entire line - so many different prints and that everything coordinates. Makes fabric choice easy. I love the fact they are precut and that you can make a great looking quilt quickly. Your Jelly Roll Jam quilt us wonderful! Pretty nifty that you an get two quilts from one jelly rol! Hey Kiddo, I watched the video yesterday, and it goes together quickly (the quilt, that is)!! And I love jelly rolls because I don't have to cut all those 2.5" strips, and I love getting one of every fabric in the line!! :-) Hugs, H in Healdsburg And the Soho chic is on my wish list! :-) Have a great day Sweetie!! JRs are perfect for several of my favorite quilt patterns - with very little cutting. Thanks! I love that the jelly rolls have just a little snippet of all the great colors and designs of the whole line. There are so many great patterns out there - I have a list of at least 20 that I'd love to make! I love that you get some of each of the fabrics in a range. Plus I just love to look at them! LOL! I like getting a piece of each fabric in the collection. So much of the cutting is already done for you and you get such a good selection. I love the convenience of the pre-cut strip, the variety of prints in most jelly rolls and that it's possible to make a decent sized quilt with just one roll. I love the variety of colors and patterns. I also like the easy of using a jelly roll to make a quilt. I like that jelly rolls have so much variety in one little bundle, and I'm sure the precut size is convenient, but I must confess I've never used one. Soho Chic is stunning in all the patterns and colorways. I haven't used a Jelly Roll yet but would love to give it a try. The colours in there are gorgeous. There's so much you can do with a 2 1/2" strip of fabric that it's hard not to love jelly rolls. The strip size can be limiting but it also forces some creativity. They're a great start to a scrappy trip too! I love the colors in your quilt! Gorgeous :) I find jelly rolls great because there are some really good patterns, like this one, that come together really quickly when the strips are all ready to piece together with minimal cutting! Jelly rolls are so perfect when making projects using the wedge ruler. No cutting, just piecing. Thanks for the chance. I love jelly rolls because they are already cut, and because they are a great way to use the whole line of fabric. Jelly rolls are the bomb! So easy to just get quilting and avoid all that messy cutting! Love jelly rolls. It's so fun to just pull them out and start sewing. They are so easy and make fantastic jelly roll quilts!!!! LOVE your quilt, colors are stunning. I have only used 1 jelly roll but I liked that there was such variety in it. And I was surprised at how much fabric was in it. I love it because when you get through quilting, you have binding already cut. I love jelly rolls because there are a kazillion patterns out there to use them and all so varied in style. I've been stressing over what pattern to use to make a quick baby quilt and I think I will settle on this one...so easy and modern looking too. I love jelly rolls because they save so much time on cutting. That's a HUGE plus in my book. I too love jelly rolls because I dont have to cut as much. I also love the fact they are coordinated. What's not to love about jelly rolls?? They are precut, made in already colored schemes nd they are beautiful! I love jelly rolls. They are pre cut and the colors all go together. This little quilt pattern is such a cute idea and you get two of them from a roll. The colors of this jelly roll are great. I love using Jelly rolls.This would be a great pattern to us with it. Love the pre cuts and the variety of prints/colors. Thanks for the chance to win! I love that I don't have to cut strips! My biggest challenge seems to be coordinating fabrics. Jelly rolls make my day. It is so much easier for me to find blender fabrics for binding and back after all the hard choices have been made for me. Thanks for another giveaway. I like that the whole line of fabric is included and there are so many neat patterns to use with them. I love that the strips are already cut. I am so bad at cutting straight and this really helps. I love that everything is coordinated and already cut so I am ready to sew! The industry has really given us a lot of patterns to use the pre cuts with so really it's a no brainer. I love this quilt and the fabric you used. Thanks for the chance to win! Giggles for me! Thanks for the chance to win. I love how versatile jelly rolls are. You can use them for projects like this and also cut them up in to squares or rectangles quickly for other projects. They sure are a time saver! I love jelly rolls because there is not much measuring and cutting involved! Awesome quilt!! I have never used a jelly roll before - looks fun and easy!! Awesome little quilty treasures! I love. Jelly rolls because you get fabric from the whole line and you don't have to cut the strips yourself. I can't wait to try this pattern! I haven't used a jelly roll yet, but I love the idea of not having to cut strips. Thanks for the giveaway. I love that jelly rolls make for quick projects! Sometimes it's just nice to make something fast! I love all the different color & prints you get in a jelly roll. I live that you get a little taste of an entire line in one little roll! I love getting a little bit of an entire line and a scrappy coordinated quilt with little effort! I love the swirl of colours on top before you unroll it! I just love working with Jelly Rolls because a majority of the cutting work is done! Unroll, organize and stitch! Love 'em! I love having the whole line of fabric in the assortment! I love jelly rolls because the material is already chosen for me. It is nice not having to decide what color looks good with what color. I do a lot of strip quilts and also love the fact that the strips are already cut. Thanks for the giveaway. I love that I don't have to cut strips! Thank you so much for the chance! I love jelly rolls because all the fabric coordinates and you don't have to think about anything but what background fabric to use with them. Also since the strips are already cut all you have to do is cut them up into smaller pieces which I find to be a fun part of making a quilt. What I love about Jelly Rolls is that I just figured out what a jelly roll is! I've heard about them from time to time, but being new to quilting, I have SO MUCH to learn! Thanks for including the pic. That makes perfect sense! I Love jelly rolls! They are so versatile. I can make so many quilts by just strip piecing them together and cutting them into different shapes. They are by far my Favorite pre-cut. Well, I've never officially used a jelly roll yet, but after my first success with a charm pack recently, I've been pinning pre-cut friendly patterns like crazy, so I'm sure I wouldn't have a problem figuring out what to do with a jelly roll. I love the one that you used because I have a quilt of blues, purples, and greens half cut, and I've been biting my nails a little bit about the way those colors will work together. Seeing the colors in this quilts gives me a little more confidence to press forward! I love jelly rolls. It helps me save my time in cutting fabric, choosing the coodinating colors and give me an accurate sewing. Jelly rolls are so convenient to use especially since I have been making hexagons size 1" that require 2.5" squares. This jelly roll quilt is terrific. To be able to whip out a baby quilt in two days is great. Thank you for sharing. I am in love with Jelly Rolls. The precut, matched colors, perfect size everything about them is wonderful! Jelly rolls are time savers and so easy to sew with. Love the baby quilts. I have never had the pleasure of working with a Jelly Roll. I would love to get my hands on this one. I love the different fabrics in the roll and knowing that they will all work well together plus they are precut so help make putting together the quilt really speedy. I enjoy working with jelly rolls since they are pre-cut and that makes for a quick quilt with all the fabrics working together. Thank you for a chance to win.